Four first half goals, including a brace a piece for Curtis Bateson and James Clifton; booked the Reds spot in the Emirates FA Cup First Round with a clincal display against St Neots on Saturday. Billy Heath brought in new signing Sam Hird into central midfield, Danny Clarke and Nathan Hotte also returned to the side. The Reds started with impetus with Bobby Johnson earning a early free kick, Bobby swung the ball in but captain Luke Shiels was unlucky not to get a clean connection on the effort which went wide. Alfreton were dominating the early possession and earned corner after corner, Johnson delivered towards Richard Peniket at the far post and the striker did well to earn a throw on the far side. But with five minutes on the clock, Alfreton took the lead. Curtis Bateson picked the ball up on the left wing and curled a ball into the box which sailed all the way through to the far corner without getting a touch, to settle the early nerves in the contest. St Neots looked to respond and aimed to pick out ex Red Nabil Shariff but Luke Shiels and Josh Gowling remained solid to prevent inroads. We earned several more corners as the pressure continued on the visitors, Johnson delivered the first one low which was cleared towards Bateson who drove into the box and earned yet another corner. The second one was aimed towards the far post and we won another throw. It was nearly two on 15 minutes, a sensational ball from Josh Wilde on the left was inches away from Peniket's head, St Neots defended well at the far post to deny Johnson. Just a minute later, the Reds earned their first penalty of the game as Peniket was held in the box and went to ground following a corner, the referee deemed the contact enough to warrant the penalty. James Clifton stepped up and fired low to Reynolds right corner to extend our lead. On 21 minutes it was 3-0, a rapid break away saw Peniket through, he looked to check inside his man and the resulting tackle led to a loose ball falling nicely for the unmarked Bateson in the box and he slotted the ball into the left corner to the delight of the Reds faithful behind the goal. The rampage continued on 27 minutes with another penalty awarded for the Reds, Wilde raced through on the left into the box and was bundled down from behind to give the Reds another spot kick. Clifton stepped up again and this time finished high into the top corner. Shiels headed a Johnson corner over before Reynolds had to be alert to get a crucial touch on the ball to deny Bateson getting past him in the box. A big moment in the game came just before the break when Gowling took down Shariff when the Saints striker would have been clean through on goal. Josh looked like the last man and St Neots protested for a red card only for the Referee to warrant a yellow instead. Gowling appeared to have took some of the ball and with Josh Wilde being able to recover the danger from the left side, the Reds may have considered themselves lucky but also in agreement with the yellow card. The second half saw the Reds manage the game well with the damage done in the first half. Declan Bacon and Martin Riley came in for Shiels and Gowling and Bacon nearly made it five with a looping header from a Johnson cross which hit the bar. Clifton hit a free kick into the St Neots wall before Reynolds made a good reaction save to deny Bacon at the far post. St Neots had their moments of pressure in the second half, a curling free kick looked to have been tipped wide from Sam Ramsbottom only for a goal kick to be given. Parr flicked a low cross wide as the Saints earned several corners. Ramsbottom produced a sharp save from point blank range as Shariff powered a header straight at the Reds keeper from a corner. Peniket came close with a quick turn and strike which went wide of the left post. The Saints continued to push, Nathan Hotte was alert to clear several corners away before the Reds should have made it five on 81 minutes as a deadly counter attack saw Bacon into the box and he squared to Bateson who was denied by Reynold's legs and the follow up from Curtis was blocked. Ramsbottom preserved his clean sheet with another outrageous save from around two yards with his leg to deny a stabbed effort. 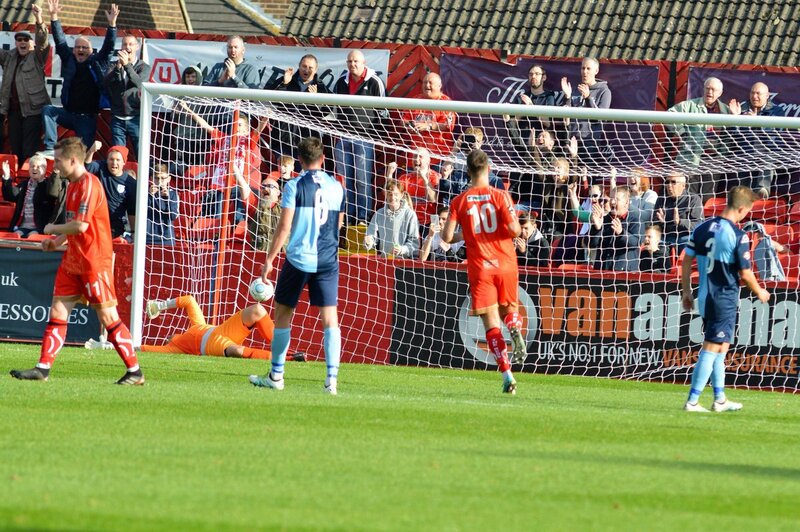 However the Reds eased to a place in the FA Cup First Round with the first half display devastating the visitors. All at the club will now be waiting with excitement for Monday's First Round draw which will be live on BBC Two from 7pm! ALFRETON: Ramsbottom, Clifton (Clackstone 88), Wilde, Hird, Gowling (Bacon HT), Shiels (c) (Riley HT), Bateson, Hotte, Clarke, Peniket, Johnson. Subs Not Used: Nicholson, Chettle, Sinnott, Platt.